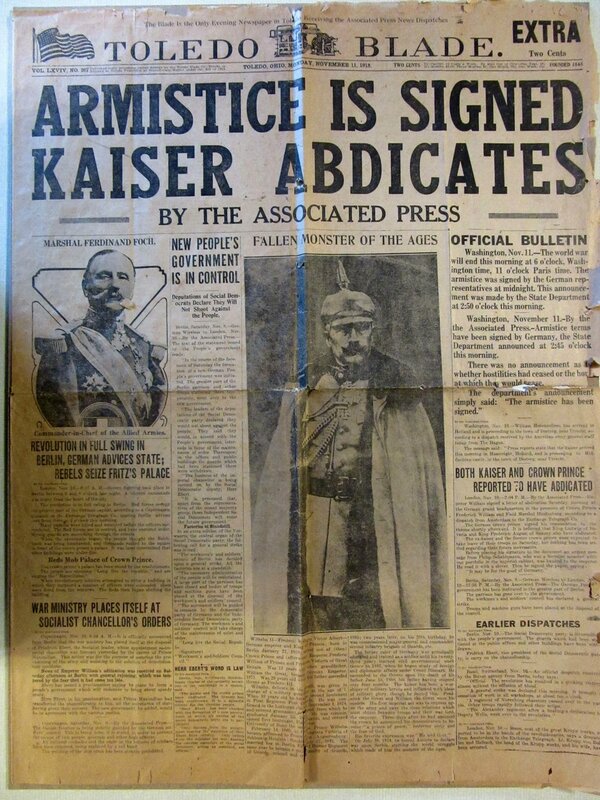 Armistice Day, the day the agreement to end the war was signed on the eleventh hour of the eleventh day of the eleventh month of 1918. It was called the “great war” and the “war to end all wars” because the warfare was so terrible and the death toll so great from machine gun fire, heavy artillery, poison gas, submarine attacks, etc. that surely mankind could never sustain such a conflict again. How naive we were! The next generation would have to live through it all again. It is hard to believe that only 100 years ago the world was such a different place. The copy of the Toledo Blade shown in our photo, dated November 11, 1918, talks of kings, princes, czars and other forms of royalty ruling much of Europe and mid-east at that time. Air warfare was in its infancy and played a minor role in that war. German submarines, on the other hand, took a terrible toll on shipping and led to shortages of food, fuel and some strategic materials. This, plus the need to supply our armed forces, led to rationing of food, fuel, rubber, etc. which the public supported with patriotic fervor. War bonds and saving stamps were sold to support the enormous cost of the war and women entered the labor force in large numbers for the first time in history. The end of the war under terms dictated by the U.S. and allied forces changed the world map and many systems of government. The holiday known as Armistice Day has morphed into Veterans Day since World War II and subsequent conflicts. Note: This year marks 100 years since World War I ended. The Waterville Historical Society has illustrated this significant event with displays of WW I artifacts, including this newspaper, at the Robbins House Museum, throughout the year. We hope many of you have visited and appreciate the sacrifice of so many American men and women, including our own Watervillians whose artifacts were included in this display. Your Waterville Historical Society is dedicated to preserving and presenting our local history and public support is vital to our mission. The Toledo Lucas County Library Local History Department has scanned all of our WW I letters from Alfred Graf and they now can be seen on the “Ohio Memory, A Collaborative Project of the Ohio History Connection and the State Library of Ohio.” Of course you are always welcome to come to the Wakeman Archival Research Center to read the letters.